Aka or A.k.a. – What is Correct? Home » Aka or A.k.a. – What is Correct? Should you use aka or a.k.a.? If you have ever stressed over those three little periods, you aren’t alone. Both aka and a.k.a. see frequent use in print, but the rules of style guides and formatting standards are often strict and unforgiving. Many college students see MLA formatting as rigid and inflexible, until they are required to adhere to APA formatting or Chicago style and learn to see MLA as relatively indifferent to most formatting minutiae. In this case, though, most sources are in agreement. Continue reading to learn whether you should use a.k.a. or aka. What is the Difference Between A.k.a and Aka? In this post, I will compare a.k.a. vs. aka. I will use each version in an example sentence or two, to give you an idea of how they should appear in context. Plus, I will show you a memory tool that makes it easier to choose the preferred spelling of this abbreviation. What does a.k.a. mean? A.k.a. is an abbreviation of the phrase also known as, which introduces pseudonyms or other ways to refer to something. It is popular in many writing contexts, and most English users will be familiar with it. The Milwaukee Brewers (a.k.a., the second-to-last place NL Central team in 2016) are challenging the Chicago Cubs (a.k.a., the world champions in 2016) for the division lead. Martin, a.k.a. Mart or Marty, is a pleasant young man who seldom disturbs those around him. A.k.a. should be pronounced “ay-kay-ay,” never “ah-kah.” In other words, you should spell out the individual letters when speaking them aloud. What does aka mean? Aka is another spelling of the same abbreviation. The only difference is that it leaves out the periods. Aka is still pronounced “ay-kay-ay,” and it means exactly the same thing and fits into all the same contexts as a.k.a. In fact, most sources prefer aka to a.k.a., including AP style, Merriam-Webster, and the Oxford English Dictionary. Too many periods can be clunky or confusing, especially in scientific contexts, which are often already clogged with decimal points as part of statistical notation. 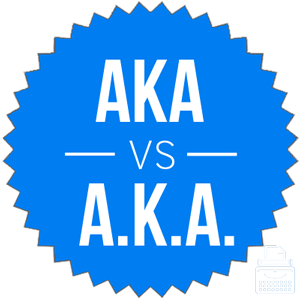 Aka is simpler and cleaner, and since it doesn’t resemble the spelling of any other common English word, there is little reason to keep the periods in this abbreviation. This chart graphs aka vs. a.k.a. in English books since 1800. Since it only looks at books, it isn’t exhaustive in its scope. It does, however, clearly illustrates a long-term usage trend. Trick to Remember the Difference? For all the reasons discussed above, you should choose aka over a.k.a. unless you have been specifically instructed not to do so. Since the Associated Press doesn’t include periods in the abbreviation of its own name (AP), it ought to be simple to remember that AP doesn’t recommend using them in the abbreviation aka, either. Is it a.k.a. or aka? Aka and a.k.a. are abbreviations of the phrase also known as, which introduces pseudonyms and other ways to refer to something. Both forms are popular, but most dictionaries and style guides prefer aka, so you should, too. 1 What is the Difference Between A.k.a and Aka? 2 When to Use A.k.a. 4 Trick to Remember the Difference? Underway or Under Way – What is the Difference? Cactuses or Cacti – Which is Correct?